Information on pollen dispersal is essential for the risk assessment and management of genetically modified organisms (GMOs) such as Bt maize. We analyzed data on maize pollen deposition at 216 sites in Germany, Switzerland, and Belgium from 2001 to 2010. All data were collected using the same standardized sampling method. The distances between sampling site and the nearest maize field ranged from within the field to 4.45 km. Maize pollen deposition was negatively correlated with distance from the nearest pollen source. The highest pollen deposition was within the field, but depositions of several thousand pollen grains per square meter were recorded over the kilometer range. A power function model most accurately described the relationship between deposition and distance from the nearest pollen source, rather than the exponential model currently used in EU risk assessment and management, which underestimates exposure for distances greater than 10 m. Regression analysis confirmed the high significance of the power relationship. The large variation in pollen deposition at a given distance reflected the influences of wind direction and other meteorological and site conditions. Plausible variations of single values and the predicted mean pollen count at a given distance were expressed by confidence intervals. The model described here allows estimations of pollen deposition in relation to distance from the nearest field; therefore, it will be valuable for the risk assessment and management of GMOs. Our results indicate that buffer zones in the kilometer range are required to prevent harmful exposure of non-target organisms to GMOs. Wind pollination is a successful strategy for many plants, and pollen can be transported over long distances. Many agricultural or biological questions relate to gene flow mediated by pollen, and information on gene flow is crucial to understand introgression and seed purity. However, it is important to distinguish between work carried out on gene flow (including cross pollination) and that carried out on pollen deposition itself. This is also true for assessing genetically modified (GM) crops. With GM crops, gene flow may lead either to introgression into wild relatives - or to the presence of GM material in seeds, harvested materials, feed, or foodstuffs. Because there is a legal obligation for GM and GM-free agriculture to co-exist in Europe ,, much research has been carried out to understand and manage gene flow from GM crops to other crops of the same or closely related species -. Pollen dispersal, independent of its ability to facilitate vertical gene flow, has been addressed in many studies related to human health, especially pollinosis. Consequently, many aerobiological studies have focused on airborne pollen. Most countries have networks to systematically monitor for the presence and prevalence of allergenic airborne pollen. However, the samplers used in this type of monitoring are commonly located on the tops of buildings in cities or villages, and the analysis focuses on those types of pollen that trigger allergies. For this reason, such data are of limited value to assess pollen deposition from agronomic crops like maize. Information on pollen deposition is indispensable for the risk assessment of GM crops containing novel and/or toxic proteins. Because pollen grains are carried by wind into the surrounding landscape, quantitative data on pollen deposition are needed to estimate the exposure of non-target organisms that may consume the pollen deposited on their host plants. To date, almost all insect-resistant GM crops contain insecticidal proteins derived from the soil bacterium Bacillus thuringiensis (Bt). Different toxins may be produced against pest species in the Lepidoptera or Coleoptera. Despite the assumption that Bt toxins are highly specific, many of these toxins actually show cross-order activity ,. Several Bt toxins have been reported to affect non-target taxa -, especially non-target Lepidoptera -. There are increasing numbers of Bt crops that express more than one Bt toxin. Stacking of Bt genes results in increased environmental exposure to Bt toxins and, thus, in increased risks of effects on non-target organisms. Second- and third-generation GM crops, which may produce pharmaceutical or industrial compounds, are expected to add to this problem. Because of the increasing abundance and range of GM crops, it is even more important to collect background data on pollen deposition and exposure for appropriate risk assessments of genetically modified organism (GMOs). Maize belongs to the anemophilous (wind-pollinated) grass family and produces vast amounts of pollen. Depending on the variety and growing conditions, each plant releases from approximately 5 million to 50 million pollen grains per season. Assuming an average density of 7 to 12 plants/m2, a 1-ha maize field sheds approximately 1011 to 1013 pollen grains over the flowering season -. Maize pollen is relatively large and heavy with a diameter ranging between 80 and 125 μm. Its settling velocity in calm air ranges from 0.15 to 0.4 m/s, with an average of approximately 0.2 m/s ,. Assuming a mean height of 2.5 to 3.5 m for a maize plant with its tassel at the top, maize pollen would settle on the ground after approximately 10 to 20 s in calm air. Considering this time, and an average wind speed of 2 m/s (e.g., that in Germany in summer), maize pollen should be deposited in the range of 20 to 40 m on average. This may be one reason why some researchers focused on short distances of a few meters from the field edge when measuring maize pollen dispersal ,-. However, data from field measurements have led us to question these assumptions. Several studies have shown that maize pollen grains are dispersed over larger distances and in larger amounts following a power function of distance with a long tail, indicating long-distance pollen transport ,,-. Also, certain factors that had been overlooked in earlier studies were reconsidered. For example, turbulence, heat-induced up-drifts, and the stronger winds that typically occur during the maize flowering period in summer can enhance the release and dispersal of maize pollen. These factors correlate with the warm, windy, dry weather conditions during the daytime that trigger the maize pollen release ,,,,,,. A major difficulty when assessing pollen dispersal and deposition from data in the literature is that different and/or non-standardized methods have been used in various studies. This makes it difficult, if not impossible, to compare the results. In this study, we analyzed data on maize pollen deposition obtained using the pollen mass filter (PMF) passive aerosol particle sampler over 10 years of field measurements at 216 sites in Germany, Switzerland, and Belgium. The methodology used has been standardized according to the VDI standard 4330-3 (which gives the general norm for all pollen types)  with the specifications for maize pollen described in . This guarantees comparable data. The aim of the study was to analyze the data on maize pollen deposition in relation to distance from the nearest maize field. This reflects the basic rule applied in regulations based on minimum distance requirements (i.e., isolation buffer zones). The variability of data represents maize pollen deposition under common cultivation conditions in Central Europe. The information presented here substantially extends the database and conclusions of an earlier report . There are many methods for pollen sampling, ranging from simple sticky traps such as slides or Petri dishes covered with an adhesive like Vaseline to more sophisticated devices such as high volume samplers with automatic pollen detectors . The methods are usually tailored to meet the specific requirements of the research area. Simple methods like sticky microscope slides or Petri dishes are cheap, simple, and widely used ,, but they are limited to semi-quantitative measurements of pollen deposition ,. For quantitative assessments, more sophisticated methods are required. Aerobiological sampling methods, their applications, and their advantages and disadvantages have been systematically reviewed by Gregory  and Edmonds , and sampling methods for pollen monitoring have been reviewed by Giesecke et al. . For general aspects of aerosol measurement, we refer to Baron and Willeke , while the relevant methods have been reviewed by McMurry . In this study, maize pollen sampling was performed using the PMF passive aerosol sampler. This method was developed in 2000 to trap airborne pollen for GMO monitoring . The complete method from sampling to analysis has been validated and standardized for the measurement of pollen deposition by the Association of German Engineers . Being a passive sampler, the PMF needs no power supply and can be exposed continuously for more than 4 weeks. The method generates a single number that quantifies total pollen influx over the whole exposure time (flowering period). Because this method is standardized, pollen depositions can be compared directly among different locations or years. The method is suitable for many agricultural crops. In the standard version, the passive sampling system consists of two passive sampling units: the PMF and the Sigma-2 (Figure 1). 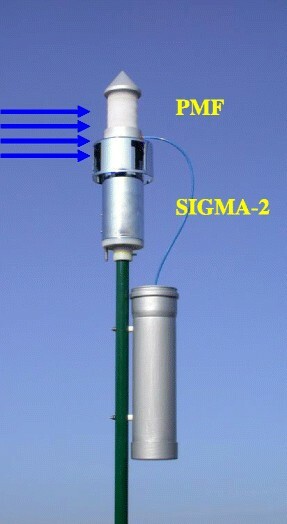 The Sigma-2 consists of a sheltered vessel that contains an adhesive slide or foil, which is protected from rain. This slide/foil is used for direct quantitative microscopic analysis of the deposited pollen grains. The PMF has a higher sampling efficiency than the Sigma-2 and collects larger quantities of pollen that can be used for additional analyses; for example, molecular analyses such as polymerase chain reaction (PCR) of pollen DNA or enzyme-linked immunosorbent assay (ELISA) for proteins and toxins ,,. The PMF sampler contains a filter unit consisting of eight stratified polypropylene filter ronds, which have low aerodynamic resistance to the ambient air passing through them. Aerosol particles larger than 10 μm, such as pollen, are retained in the filter. Pollen grains washed off by rain are collected in a 1.5-L PET flask connected to the body of the PMF sampling unit. While the Sigma-2 is restricted to particle sizes with an aerodynamic equivalent diameter of smaller than 60 μm , the PMF unit is well suited to capturing larger pollen grains (e.g., maize pollen, 80 to 125 μm). Therefore, it has been used for the quantitative microscopic pollen analyses and assessment of maize pollen deposition in the studies that produced the data reported here ,. The standard exposure height of the PMF sampling unit is 1.8 m above the ground. Passive pollen sampler PMF/Sigma-2, standardized using VDI-standard [] for assessment of maize pollen deposition []. We analyzed data on maize pollen deposition collected from 2001 to 2010, at 216 sampling sites in Germany, Switzerland, and Belgium (Table 1, Figure 2). The sampling sites used in this study relate to different research and monitoring projects and reflect the heterogeneity of common maize cultivation (different field sizes, field arrangements, varieties). They also reflect variations in environmental conditions (regional, topographical, and meteorological conditions), as well as different positions relative to the nearest maize field and different wind directions. For all sampling sites, the distance to the nearest maize field was recorded. Exposure time includes main flowering period of maize at each site. 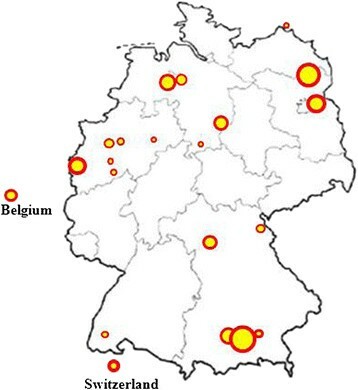 Location of 216 sample sites in Germany, Switzerland, and Belgium. Dot size indicates sample size (see Table 1). Daily pollen shedding values and, consequently, the pollen deposition values vary greatly depending on meteorological and growing conditions. Therefore, to characterize the intensity of pollen deposition for any season and site in a comparable way in a single figure, the total accumulated deposition over the maize flowering period must be taken as an appropriate parameter ,-. Because pollen production and maize pollen release vary considerably over time, the accumulated pollen deposition over the whole flowering period is the best measure of the overall intensity of pollen deposition at each site. This parameter is more reliable when based on the whole flowering period, rather than on shorter time intervals. For all data presented here, the exposure time of the PMF samplers covered the main maize pollen flowering period in each particular area (3 to 5 weeks and sometimes longer). Whereas any calculated mean deposition rate based on a fixed time span (daily, weekly, or other) would depend on the number of days of exposure, the total accumulated deposition covering the whole flowering period is a more stable and comparable quantity. All deposition data analyzed in this study were obtained in the same way according to the VDI standard 4330-3  specific for maize  as follows: the pollen samples were removed from the filter pads of the PMF and from the liquid in the 1.5-L attached flask by using an ultrasonic bath (Sonorex Bandelin Super RK 102, BANDELIN electronic GmbH & Co. KG, Berlin, Germany) and vacuum filtration (Sartorius, Göttingen, Germany). These procedures sedimented the aerosol particle sample as a filter cake on an acetyl-ethylene membrane filter (12 μm pore size, 50 mm diameter, Whatman, Maidstone, UK), after pre-filtering the liquid through a 125-μm metal mesh test sieve (100 mm diameter, Fritsch, Idar-Oberstein, Germany). Sample quality was checked by examining the filter cakes under a binocular microscope. A sample from each filter cake was transferred into a 15-ml tube. After centrifugation (500 × g for 5 min), the volume was reduced to 2 ml. Then, 2 ml glycerol was added to give 4 ml 50% glycerol pollen suspension (density 1.1 g/cm3). The pollen suspension was mixed with a shaker and stored at −20°C until subsequent analysis. The pollen suspensions were carefully mixed, and subsamples were taken to determine the number of maize pollen grains per PMF sample microscopically. Pollen was quantitatively analyzed using the dynamic counting method ,, under × 400 magnification using a Nikon Eclipse E200 microscope (Nikon, Tokyo, Japan). The absolute detection limit for maize pollen counting is determined by the discrete number of one detected pollen grain in the sub-sample for counting. The relative detection limit of maize pollen depends on the total number of pollen grains counted. The dynamic counting method ensures comparable results of maize pollen counting; the detection limit remains in the range of <0.1% of the total pollen count, relatively and absolutely, until the maize pollen count is greater than 3 at least. This is achieved by adjusting the volume of the sub-sample to be analyzed until approx. 3,000 total pollen grains were counted and maize pollen grains were detected. Using a micropipette, sub-samples (volume, 10 to 50 μl) were taken from the glycerol pollen suspension and the maize pollen grains and total pollen grains were counted. Several subsamples with corresponding volumes were subsequently taken and quantified. The cumulated pollen counts of the sub-samples were then extrapolated to the total sample, giving the maize pollen count per PMF sample (Ni). Fi, is the horizontal flow for pollen of species i in air (n/m2), N i is the number of pollen grains in the sample, i is the pollen from species i; here, maize pollen, Ei, PMF is the sampling efficiency of the PMF (0.35) for maize pollen compared with the volumetric standard pollen trap (Hirst type/Burkard). The sampling efficiency depends on both the collector type and the characteristics and behavior of the aerosol particle, in this case, the pollen type. The average sampling efficiency of the PMF for maize pollen was estimated to be 0.35 by calibration to a Hirst-type volumetric pollen trap , the standard trap used by the European and German Aerobiology Networks. Di is the accumulated total deposition of pollen species i over the flowering period, u is the mean wind speed, and vd,i is the mean deposition velocity for maize pollen (m/s). The values for deposition velocity of maize pollen reported in the literature range between 0.15 and 0.4 m/s, with mean values around 0.2 m/s ,. In this study, we assumed an average deposition velocity for maize pollen of 0.2 m/s and an average wind speed of 2 m/s, which is typical for July/August in Germany. For the statistical analyses of the data, we used Microsoft Excel® , the statistic tool XLSTAT-Pro 2011 , SegReg , and R software , specifically the mcgv package . A necessary property of an adequate statistical model for the relationship between distance from the pollen source (X) and pollen deposition (Y) is that the model produces predictions that are non-negative and that tend towards zero for large distances. Simple models with these properties include the exponential model Y = eb+c·X, c <0, used for risk analysis in the EU -, and the power model Y = a · X m with m <0, used by Aylor et al. , Arrit et al. , and Boehm et al. . Both models can be linearized to facilitate calculations. If the data follows a power model, then log10Y and log10X are linearly related (log10Y = log10a + m · log10X), with the corresponding plot showing points scattered around a straight line. If the data follows an exponential model, then log10Y and X are linearly related (log10Y = b · log10 e + c · log10 e · X), and a plot of log10Y versus X shows a linear relationship. Standard linear regression techniques were applied to (log10Y, log10X) and (log10Y, X) to obtain optimal (least squares) estimates for the regression parameters (a, m) and (b, c), respectively, together with confidence intervals for the parameters and predicted values. Residual plots were used to check the homoscedasticity of the error variance. Logarithms with base 10 were used in all cases. The goodness of fit of the models was expressed by the coefficient of determination, R2, which was also used as the criterion to select the optimal model. The consistency of the optimal model, with regard to a potential change in the model characteristics over distance, was checked by fitting a segmented linear regression (the ‘hockey stick approach’), using the open source statistical program SegReg . To detect a nonlinear component in the deposition-distance relationship beyond one that might be identified by a segmented linear regression, a smooth curve based on a regression spline approach was fitted to the residuals of the optimal model using the ‘gam’ model of the mgcv package in R ,. This type of curve would uncover any reasonably smooth nonlinear component in the relationship. Because the complete dataset was obtained over a long period (2001 to 2010), a test for a change in the deposition-distance relationship over time was performed by comparing the regression line from data collected in 2001 to 2006 (122 samples)  with that for deposition data collected in 2007 to 2010 (94 samples). In Figure 3, the data values from these two periods are shown in different colors. The hypotheses tested were H0: ‘common regression line for both sampling periods’ against the alternative HA: ‘specific regression line per sampling period’. An F test was used for the comparison. For illustrative purposes, a linear and a cubic polynomial were fitted to the untransformed data, although these approaches do not meet the above requirements of generating non-negative predictions that tend towards zero for large distance. Maize pollen deposition versus distance to the next maize field. Data points from field measurements 2001 to 2010 (gray/dark, data from 2001 to 2006; light blue/light, data from 2007 to 2010; N =216) and results of regression analysis (linearized power regression equation log10Y = −0.585 · log10X + 6.104, R2 = 0.709, p <0.001; power regression equation, Y = 1.271 · 106 · X−0.585; Y, deposition in n/m2; X, distance to nearest maize field in m). Central bold blue line, expected deposition; dashed lines, confidence interval for expected deposition; red solid lines (outer lines), 95% confidence intervals for single predictions. Deposition values in n/cm2 were obtained by multiplying displayed deposition values by 0.0001. Pollen deposition was measured at 216 sites with distances to the nearest pollen source ranging from 0.2 m (within the field) to 4.45 km away from the nearest edge of the maize field. The values of maize pollen deposition varied from 23.3 million pollen grains/m2 (2,330 pollen/cm2) within the field to 2,857 pollen grains/m2 at further distances from the field. Y is the deposition of maize pollen (n/m2), X is the distance to the nearest maize pollen source/field edge [m], and n is the number of pollen grains. The above power function was highly significant (p <0.001) with distance accounting for 70.9% of the total variation in deposition (R2 = 0.709). Figure 3 shows the data and the fitted curve with confidence intervals on log-log transformed axes. This presentation turns the power relationship between the X and Y variable into a linear relationship. The scale on the left vertical axis denotes pollen deposition in the standard unit (n/m2). 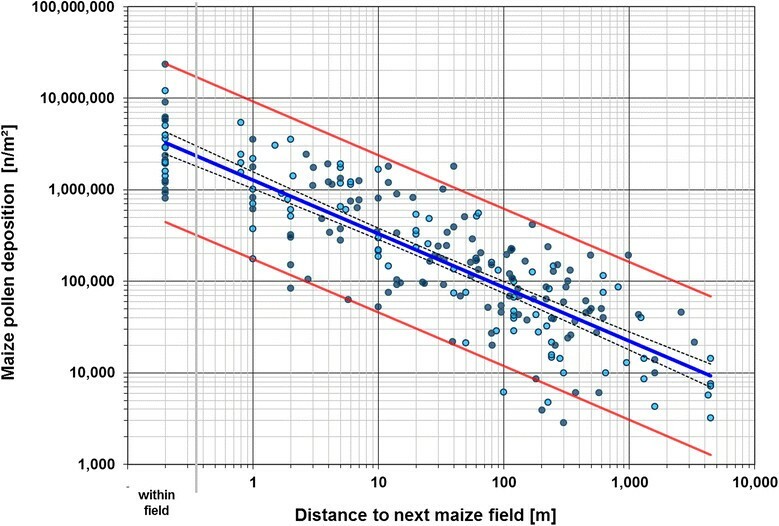 The horizontal axis shows the distance to the next maize field, ranging from within the same field (0.2 m) to 4,450 m. Table 2 shows the estimated regression parameters. log10Y = −0.585 · log10X + 6.104; Y, deposition in n/m2; X, distance to nearest maize field in m, N = 216 observations. Field data are shown in Table 1. Figure 3 shows the good fit over the data range. It also shows that data points are scattered around the regression line with nearly constant variation over the distance range, as required by the assumptions for standard regression analysis. This finding is confirmed by the standardized residuals plot (Figure 4). Standardized residuals for regression line shown in Figure3. X, distance from nearest maize field in m.
with a coefficient of determination R2 = 0.078 (p <0.001). The cubic polynomial shows a slightly better, but nevertheless poor, quality of fit with 7.8% of the variation in Y explained by X. For the linear function, all predictions for distances greater than approximately 2,400 m are negative. For the cubic polynomial, distances between 380 and 1,900 m and greater than 4,400 m generate negative predictions for pollen deposition, interrupted by positive predictions for distances between 1,900 and 4,400 m, with a local maximum at about 3,200 m. The polynomial model for the relation between deposition and distance previously published by Lang et al. (equation: Y = 74.75 − 9.71 · X + 1.32 · X2 − 0.08 · X3) was similarly inacceptable, predicting negative deposition for all distances greater than 13 m. These model fits are numerical examples of the fact that (non-constant) polynomials tend to plus or minus infinity for large distances instead of converging to zero, as is required for a reasonable model. Even worse, as demonstrated by the third-order polynomial, high-order polynomials can exhibit erratic behavior outside the X data range and even in the observed X range. A segmented linear regression showed no improvement of fit compared with that of a single linear regression line on a log-log scale over the whole distance range, from within the same field to 4 km (p >0.050). The improvement in the goodness of fit after adding a nonlinear smooth component to the power model was practically zero (p =1), and the R2 value was increased by only 0.00014. For this reason, and because neither the graphical check of the regression line (Figure 3) nor the residual plot (Figure 4) suggested deviations from linearity, the power model was accepted and no further nonlinear models for the distance effect were investigated. The regression equations were not significantly different between the two sampling periods of 2001 to 2007 and 2008 to 2010 (F test; p =0.107). The results from the goodness of fit calculations and the consistency checks confirmed the superiority of the power model (Equation 3) over the exponential model (Equation 4) and confirmed the validity of the power model for pollen deposition over the whole distance range examined. Several previous studies ,,, have arrived at the same conclusion, namely, that the decrease in pollen deposition with increasing distance follows a power function. The exponential model used in some studies ,, and the polynomial model used in others  are not appropriate in the light of the present dataset because of their poor fit and their implausible predictions of pollen behavior over large distances. The difference between the power function and the exponential function fitted to our data lies markedly in the curve tail, where the exponential curve underestimates pollen deposition, especially at long distances. This raises questions about the accuracy of some risk assessments of genetically modified plants in the EU based on an exponential relationship -. The reason why different authors proposed different curve shapes for the relationship between deposition and distance may be explained by the different distance ranges of the data used in the analyses. Looking at the data from a narrow distance range, a power function, an exponential function, a polynomial, or even a straight line may fit the data quite well. However, a model derived from short distance range data of a few meters cannot reasonably be extrapolated and expected to fit long-distance data. The exponential curve for pollen deposition used in the EU risk assessment is given in Perry et al. , page 4, equation 2.3, 2.4, and related text], based on the data of Wraight et al. . Amending the stated factors, the equation for the exponential curve of maize pollen deposition on slides (n/cm2) versus distance (m) is log10Y = 2.368 − 0.145 · X. The dataset used was limited to a distance range of 7 m from the field edge. In this range, both the exponential model of Perry et al. and the power function derived here produce acceptable predictions. However, as illustrated in Figure 5, extrapolating the exponential curve to distances greater than 10 m leads to a rapidly descending curve with increasing discrepancies from field measurement data and from the respective power regression line. Exponential model of EU risk assessment compared with power model described in this study. For maize pollen deposition versus distance to nearest maize field. Circles, data points from field measurements 2001 to 2010 (N =216). Blue solid line, expected mean deposition calculated using power regression equation Y =1.271 · 106 · X−0.585; Y, deposition in n/m2; X, distance from nearest maize field in m; dashed lines, confidence interval for expected deposition; dotted lines, 95% confidence intervals for single predictions; red line, exponential model used in EU risk assessment (Perry et al. , deposition values on slides used in equation 2.3 corrected for stated factor 3); solid, predictions within database up to 7 m from field edge; dashed line, extrapolation of exponential model over distance >7 m.
The power regression line (Equation 3) provides estimates for the mean expected pollen deposition at given distances from the pollen source. The mean values predicted from the regression equation range from 3.26 million pollen grains/m2 (326 pollen/cm2) close to the pollen source to 9,340 pollen grains/m2 (0.934 pollen/cm2) at 4,450 m away from the next field margin (see also Table 3). The uncertainty of this prediction is expressed by the 95% confidence interval (CI) of the mean regression line (Figure 3, fine dotted lines). Obtained from the regression model in Table 2 for various distances to the next maize field. Database, 216 sites (see Table 1). Prediction for means and single observations are identical but their confidence intervals differ, essentially depending on 10sd_log (see Equation 7 in the text). where the constant c depends on the number of observations and the coverage probability of the confidence interval. In contrast to the usual form of a confidence interval (‘mean value ± constant c’), here, the multiplicative forms ‘mean value/factor c’ and ‘mean value · factor c’ apply. For the present data, with n = 216 and a coverage probability of 95%, c = 1.97 holds for mean and single value predictions. The way to calculate sd_log differs for mean and single value predictions. Details are given in standard texts on linear regression, e.g. Neter et al. chapter 2]. As an example, Table 3 shows that at the closest distance (within the maize field), the mean value for maize pollen deposition is expected to be 3,258,000 pollen grains/m2 with a confidence interval of (2,462,000; 4,311,000) pollen grains/m2. This confidence interval can be described as (mean prediction/1.32; mean prediction × 1.32). While this consideration is for mean values, the numbers for single observations are quite different. The factor for the confidence interval of a predicted single observation is 7.33, indicating large variations among single values. This means that overall, 95% of maize pollen deposition values from single measurement sites within the field vary between the lower boundary (444,000 n/m2) and the upper boundary (23,876,000 n/m2). Half of the remaining 5% (2.5%) will be above the upper boundary, so the probability of values not exceeding the upper boundary will be 97.5%. At 1,000-m distance, single observations of maize pollen deposition are expected to be between 3,100 and 164,000 n/m2 with a mean of 22,500 n/m2 (2.25 n/cm2). Consequently, a distance of 1,000 m would be necessary to exclude a maize pollen deposition higher than 164,000 n/m2 (16 n/cm2) with a probability of 97.5% for distinct sites. In Germany, maize flowers in summer (July to August) and pollen release is favored by warm and windy (i.e., drying and turbulent) weather conditions during the daytime ,,,,. In turbulent wind conditions, pollen grains are transported higher above the ground and are dispersed over further distances than they are under non-turbulent conditions ,,,,,,,. Pollen dispersal itself varies according to wind speed and direction, other climatic conditions, topography, and factors that affect the settling velocity of maize pollen, for example, dehydration of the pollen grain . A considerable portion of our dataset represents the longer distance range (>100 m), which has been underrepresented in the literature so far. 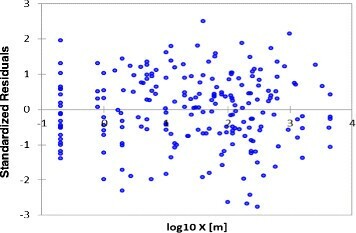 Compared with that stated in our earlier report , the maximum distance for which pollen data is reported is extended from 3.3 to 4.45 km with a total of 81 data points representing distances greater than 100 m.
The results shown in Figure 3 illustrate that maize pollen dispersal is not restricted to close distances (<100 m), but extends well beyond to longer distances up to the kilometer range. This is consistent with the findings of other studies ,-,. Maize is a wind-pollinated plant and produces enormous amounts of pollen (1011 to 1013 pollen grains/ha). Maize pollen is relatively large (80 to 125 μm diameter; 1.25 g/cm3; approx. 500 μg) and its settling velocity in air is approximately 0.2 m/s. Assuming that the average height of the maize tassel is 2 to 3.5 m above the ground, we can estimate that maize pollen settles in the range of 20 to 40 m from the field margin on average. However, this assumption would be only true under still air conditions. In the field, still air conditions are practically non-existent. As our data from real environmental conditions (Figure 3) show, maize pollen was deposited even at the farthest distance measured (4.45 km). In fact, considerable amounts of maize pollen drift on the wind over longer distances (>100 m) and even further than 1,000 m, with deposition values of 3,000 to 164,000 maize pollen grains per square meter (Figure 3). This is consistent with observations of long-distance maize pollen dispersal in other studies ,,. Brunet et al. observed that maize pollen was dispersed at even higher altitudes of several km and was transported over distances as far as 70 km. The database includes distances up to 4.45 km, which covers a distance range relevant to questions related to Bt maize dispersal. The respective power function for the distance relationship expressed in Equation 3 is highly significant within the distance range of the database. We recommend not to extrapolate to distances far beyond without specific validation. One possible estimation method would be to combine the use of the deposition database with an appropriate dispersal model. The standardized PMF deposition data serve to calibrate the model within the data range, while model predictions may be used to extrapolate over larger distances ,. These predictions are open to validation based on further standardized measurements. Under common agricultural practice, maize is rarely grown in isolated fields. The pollen deposition of several fields is expected to overlap, and more than one pollen source contributes to exposure at any single site. The potential overlap with other surrounding fields, even if they are distant, should be considered as a factor affecting the distance relationship to the nearest maize field, especially for distances greater than 100 m. This assumption has been supported in various scenarios using a dispersal model ,,. The relative proportion of overlap will depend on several factors, such as distance, the relative position of other maize fields, wind direction, other meteorological conditions, and the flowering behavior in each field. Therefore, it is difficult or not feasible to extrapolate from single field experiments to the complex situations that exist in common cultivation, that is, those situations relevant for the risk assessment and management of GMOs. The large number of locations and years represented in our dataset covers a broad range of environmental and agricultural conditions. In fact, the data used in our analyses reflect the variable conditions of common maize cultivation in central European countries such as Germany. The data cover small, single-field settings as well as complex field arrangements with no preferences for field size or shape, variety, topography, nor for the relative location of the pollen trap to the main wind direction nor to other maize fields. The distance relationship expressed in Equation 3, therefore, represents the expected values of maize pollen deposition under common agricultural practice in the studied countries. The reference to common agricultural practice is important when interpreting the variability in deposition under real field conditions. As described before, the results of the regression analysis show a relatively wide confidence interval for individual values (see Figure 3, Table 3). This can be expected, as our data include variability in pollen production, release, and dispersal resulting from different relative positions of the traps to the main wind direction, and other factors such as field size, plant density, maize variety, growing conditions, agricultural management, and weather conditions ,. The power curves and exponential curves fitted to our data showed different shapes over the distance range. Our results indicate that the exponential model previously used by some authors and currently used for risk assessment and management of Bt maize ,- is inferior to the power function in terms of goodness of fit. 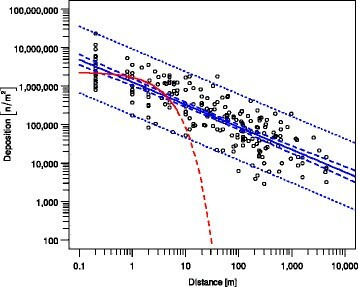 It underestimates deposition, and thus underestimates the exposure of non-target organisms to GMO maize pollen for distance ranges greater than 10 m, with increasing inaccuracy over longer distances (see Figure 5). The toxin concentration varies among different Bt maize varieties ,, and the various target insect species and their different larval instars show variations in their sensitivity to the toxin . Therefore, in risk assessment, event and species-specific variations should be considered when establishing dose-effect relationships between Bt maize pollen and sensitive species. Nevertheless, it is not practical to implement specific legal regulations for any single event. Therefore, more general measures based on the precautionary principle are required for risk management of Bt maize cultivation. Bt maize pollen, even at low pollen densities, adversely affects sensitive Lepidoptera species. For example, Felke et al. reported that the LD50 value of Bt maize pollen (Bt-176) for the fourth larval instar of Plutella xystostella could be as low as nine Bt maize pollen grains/cm2 (92,000 n/m2) , and that a single uptake of four or more Bt pollen grains was sufficient to kill larvae, with earlier instars being even more sensitive ,. The current recommendation of the event-specific EU risk assessment for Bt maize states, for example, buffer distances of 20 to 30 m between Bt maize and protected habitats of extremely sensitive butterfly species -. These recommendations have been based on an exponential curve for exposure assessment (see Figure 5 and related discussion above). The results of the present study indicate that these buffer zones may be inappropriately small. Instead, conclusions on risk assessment and risk management should be updated based on the model described here for the distance relationship of maize pollen deposition under common cultivation. With respect to a general risk management of Bt maize cultivation, and based on the precautionary principle, the upper boundary of the confidence interval of the regression for single value predictions indicates that buffer distances in the kilometer range are required to prevent exposure of protected and/or sensitive species to Bt pollen, rather than ranges of tens of meters as proposed in the actual EU risk management. To our knowledge, the results presented here represent the largest dataset on maize pollen deposition under complex common cultivation conditions published to date. The data cover variations in pollen deposition related to the use of different crop varieties, field sizes, field arrangements, wind directions, regional environments, and years. A considerable proportion of the data represents a longer distance range (>100 m), which has been lacking in the literature so far. This dataset has a high informative value because all data were collected using the same standardized sampling method, the passive sampling system PMF, according to VDI standard 4330-3  specific for maize pollen . Therefore, the pollen deposition data are comparable among different locations and years. The results show that under common cultivation, maize pollen is deposited in substantial quantities (thousands of grains per m2) over a range of up to several kilometers away from the next maize field. The distance relationship significantly fits to a power function, reflecting the long tail of pollen deposition over larger distances. Our results indicate that the exponential model previously used by some authors and currently used for risk assessment in the EU ,- is inferior to the power function in terms of goodness of fit. The power and the exponential curves fitted to our data have different shapes over the distance range. The exponential curve used in the EU risk assessment underestimates deposition and, thus, underestimates exposure of non-target organisms, especially over a longer distance range. Consequently, previous risk assessments and conclusions regarding distances, potential exposure, and effects on non-target organisms should be revised in the light of these findings. The regression model presented here allows us to predict expected deposition at a given distance. Its confidence intervals for mean and single observations provide information about the variation that can be expected to result from different site/field positions and various meteorological and growing conditions. Therefore, the results are particularly useful to optimize sample size and position when designing field studies and monitoring programs ,,. The standardized sampling method and its results can be used to validate models of maize pollen dispersal and exposure on local and larger scales. Finally, the results of this study are valuable for risk assessment, risk management, and environmental monitoring of GM maize. These findings will be especially useful for exposure assessments, for example, for tasks related to pollen dispersal and exposure such as co-existence and seed purity ,,,, and to define buffer zones between GM maize fields and ecologically sensitive areas ,,. These results will be also valuable to estimate the exposure of non-target organisms to Bt maize . In general, these results emphasize the need to collect exposure data using standardized methods for environmental risk assessments and monitoring of GMO ,,. aThe equivalent physical term would be ‘accumulated horizontal flux density (rate)’ . We used the term ‘flow’ in this study for simplicity. All authors made substantial contributions to the published study and drafted the manuscript. MO defined the conceptual framework and task, FH and WW designed and performed the study, FH contributed and/or collected the deposition data and compiled the dataset, and WW and FH conducted statistical analyses and produced the graphic representations. All authors read and approved the final manuscript. This study was supported by the Federal Agency for Nature Conservation (BfN) with funds provided by the Federal Ministry for Environment, Nature Conservation and Nuclear Safety. The authors thank all of the researchers, institutions, and federal states who generated, verified, and/or released the data used in this study. We thank Prof. Dr. H. Beismann, formerly TU München, Mr M. Debrus, Landwirtschaftskammer NRW; Dipl.-Met. V. Dietze, Freiburg; Dr. J. Eder, LfL Freising; Dr. B. Köllner, LANUV NRW Essen; PD Dr. Kratz, FU Berlin; Dr. M. Kruse-Plaß, Wölsauerhammer; Dr. W. Kumpfer, Breege; Dr. M. Kuhlmann, TU München; Dr. B. Oehen, FIBL Frick (Switzerland); Dr. L. Peichl and Mrs A. Wilk, LfU Augsburg; Prof. S. Rogg, TU München; Herr S. Salzmann, LGLN NDS; Dipl.-Forstwirt U. Schlechtriemen, TIEM Northeim; Mrs R. Schmidt, SfWuH, Bremen; Prof. Dr. B. Schröder, formerly University Potsdam, Dr. M. van den Bulcke and Dr. S. Folloni, formerly JRC, Ispra (Italien); Mr R. Vögel, LUGV Brandenburg; Dr. R. Wachter, Ganderkesee. We also thank Dr. J. Smith and Prof. Dr. W. Schröder for their support and the reviewers for their useful comments.